Brighten your favorite room with this designer wall mirror that features a segmented frame crafted in a white-washed gold finish. 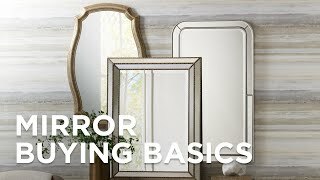 Mirrors brighten and add depth to any space, making them ideal from use in sitting rooms, hallways, or bedrooms. This design features a segmented oval frame crafted in a white-washed gold finish. Metal frame. Vertical hang only. 24" wide x 36" high x 2" deep. Glass only section is 21" wide x 33 1/2" high. Surrounding frame is 1 1/2" wide. Oval wall mirror from Noble Park. White-washed gold finish. Metal construction. Frame with straight segments.